The Si Expression 3 features 32 recallable mic preamps, plus 4 line inputs, 4 internal stereo FX returns, AES in, and a 64x64 expansion slot offering more than enough scope to use every one of the 66 input processing channels. Every input processing channel has dedicated processing for high pass filter, input delay, gate, compressor and four band EQ while keeping it under control is a comprehensive automation system augmented with four mute groups and FaderGlow to light the way so you are never lost. 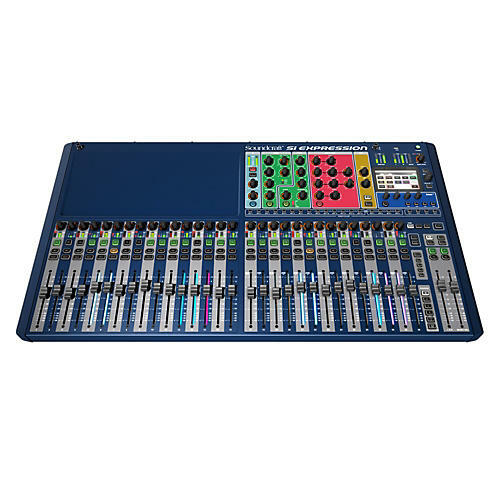 Order now and get the legendary Soundcraft sound. Dimensions (WxDxH) . . . . . . . . . . . .482mm/19" x 520mm/20.5" x 168mm/6.6"
Width with rack ears removed . . . . . . . . . . . . . . . . . . . . . . . . . . . . . 445mm/17.5"
Dimensions (WxDxH) . . . . . . . . . . .928mm/36.5" x 520mm/20.5" x 168mm/6.6"